At VFW, Romney Seeks To Dull Obama's National Security Sheen : It's All Politics President Obama has made national security an area of strength during his presidency. But Mitt Romney planned to use a speech to the Veterans of Foreign Wars on Tuesday to chip away at that advantage, hammering Obama on looming defense cuts and for alleged leaks from the White House. 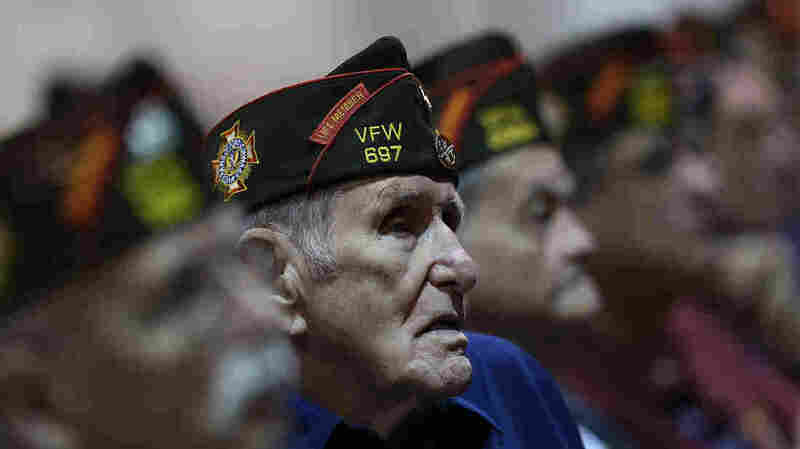 Members of the Veterans of Foreign Wars look on Monday as President Obama speaks during the group's national convention in Reno, Nev. Republican Mitt Romney was scheduled to speak to the group on Tuesday. In a result few predicted before he became commander in chief, President Obama exhibits surprising strength with voters on national security issues. The killing of Osama bin Laden, constant drone strikes against terrorist targets in Pakistan and Yemen, the U.S. role in helping to oust Libya's Moammar Gadhafi and the extraction of troops from an unpopular war in Iraq — with the plan to also do so in Afghanistan — have combined to leave Obama with high marks for national security in the minds of many voters. That presents a challenge to Mitt Romney and other Republicans: It has become difficult to make the argument that Obama has been detrimental to U.S. security. But in a speech to the Veterans of Foreign Wars convention Tuesday in Reno, Nev., Romney went after what he and fellow Republicans think could be Obama's Achilles' heel on national security. In his remarks Romney criticized the president for alleged leaks by administration officials of classified information that cast Obama in a decisive light. He also also went after the president for defense cuts scheduled to automatically occur in 2013 if Democrats and Republicans fail to reach a budget agreement that would forestall such cuts. "Today, we are just months away from an arbitrary, across-the-board budget reduction that would saddle the military with a trillion dollars in cuts, severely shrink our force structure, and impair our ability to meet and deter threats. Don't bother trying to find a serious military rationale behind any of this, unless that rationale is wishful thinking. Strategy is not driving President Obama's massive defense cuts. In fact, his own secretary of Defense warned that these reductions would be 'devastating.' And he is right. "That devastation starts at home. These cuts would only weaken an already stretched VA system and our solemn commitment that every veteran receives care second to none. I will not allow that to happen." For the record, both Republicans and Democrats last year agreed to the defense cuts among other reductions in domestic spending, as part of the pact to increase the debt ceiling last summer. "It is reported that Bob Gates, the president's first secretary of Defense, bluntly addressed another security problem within this administration. After secret operational details of the bin Laden raid were given to reporters, Secretary Gates walked into the West Wing and told the Obama team to 'shut up.' He added a colorful word for emphasis. "Lives of American servicemen were at stake. But astonishingly, the administration failed to change its ways. More top-secret operations were leaked, even some involving covert action in Iran. "This conduct is contemptible. It betrays our national interest. It compromises our men and women in the field. And it demands a full and prompt investigation, with explanation and consequence. Whoever provided classified information to the media, seeking political advantage for the administration, must be exposed, dismissed, and punished. The time for stonewalling is over. "Exactly who in the White House betrayed these secrets? Did a superior authorize it? These are things that Americans are entitled to know — and they are entitled to know right now. If the president believes — as he said last week — that the buck stops with him, then he owes all Americans a full and prompt accounting of the facts. "And let me be clear: These events make the decision we face in November all the more important. What kind of White House would reveal classified material for political gain? I'll tell you right now: Mine won't." The book Confront and Conceal by The New York Times' David Sanger helped to paint a picture of Obama as decisive and shrewd on many national security issues, including Iran. But the administration has been criticized by congressional Republicans for allegedly using classified national security details for election purposes. As Romney points out, even a top Senate Democrat, California's Dianne Feinstein, has expressed alarm about some of the disclosures. The administration has denied the charges of political leaking, with the president vowing to investigate the leaks. It's too soon to know if the constant barrage from Romney on the leak issue will be enough to damage the president's ratings with voters on his ability to protect the nation. But the issue undoubtedly gives Romney one of the best openings he's had against Obama on national security issues. Obama spoke to the VFW on Monday, highlighting the attack on al-Qaida leaders and the killing of bin Laden.